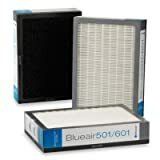 Smokestop Filter for Blue Air 500/600 Air Purification Systems , selling for $299.98 brand new. Manufactured by Smokestop Filter. There are 1 units left brand new. Replacement smokestop filter is for use with Blueair 500/600 series Air Purification Systems.